Welcome to Carnival Ecstasy. The ship has experience under its belt to ensure you have a good time. ( With a length of 850 feet, it’s a long belt! ) 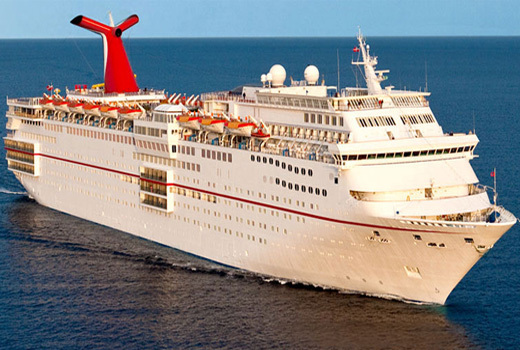 Embark Carnival Ecstasy and it will wow you and woo you at the same time. Let’s scream for Carnival Ecstasy! You will have time of the lifetime as you slip and slide through its huge sized water park. WaterWorks is a fun-factory, which is worth screaming for. Let the scream get louder. You can wander on Carnival Ecstasy and find satisfaction everywhere. The ship is preparing deliciousness at Guy’s Burger Joint and BlueIguana Cantina. It is also shaking and stirring plenty of options at RedFrog Rum Bar and BlueIguana Tequila Bar. You need to crave harder as the ship is up to it. Laughter is the best medicine and at the Carnival Ecstasy’s Punchliner Comedy Club, laughing is something which everyone does. So, flex those funny bones and let the laughter riot begin. Carnival Ecstasy has the experience under her belt to ensure that you have an amazing cruise. For starters, the bright lights of the grand atrium will remind you of the big city… and that you’re not on just any ship. You’re on a ship that features great fun for the kids with the range of supervised youth activities for cruisers 2–17… including Seuss at Sea. You’re on a ship with plenty for the adults to do — sit back and chill at the Serenity Adult-Only Retreat and the rather relaxing spa, or sip back something chilled at RedFrog Rum Bar and BlueIguana Tequila Bar. Or order up something a little different — like a cool cocktail complete with a flaming citrus peel — at Alchemy Bar. But let’s not forget that, most of all, you’re on a ship that everyone can enjoy! There’s Carnival WaterWorks for those who’ve just gotta make a splash, Punchliner Comedy Club for the not-so-easily-amused, Playlist Productions for those who appreciate a good song-and-dance revue, and Hasbro, The Game Show for those who take their fierce competition with a soft side of fun. And for any appetite there are plenty of restaurants to choose from as well.